Solution Tender: Real love is not based on romance , Is Based On Respect. Real love is not based on romance , Is Based On Respect. 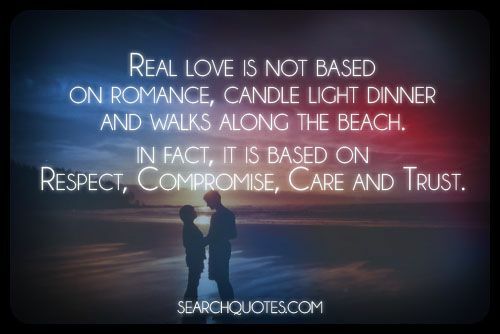 Real love is not based on romance, candle light dinner and walks along the beach. In fact, it is based on Respect, Compromise, Care and Trust. Real love is knowing who you want to be with forever, and loving them so much that you would rather be gone from this Earth than to still live and see them go. Real love isn't the easiest thing to find in this crazy world, but when you find it, be sure to hold on to it. Real love is rare, and it should be encouraged, nurtured, and grown to its fullest potential, of course willing that the time is right for both parties. Love is much more than a beautiful thing, love is what changes lives. Love is what helps keep people alive physically, emotionally, and spiritually. Love is full of challenges, but it is most definitely also full of reward! We should all make an effort to love someone so much that we can't live life without them, for without experiencing love; man nor woman will ever really experience life.